A couple of weeks late on this. The Fourth Circuit held that all the Fourth Amendment claims by the Duke lacrosse players against the investigating police officers should have been dismissed on qualified immunity grounds.The court did allow state law malicious prosecution claims by the three indicted players, but not by the 30+ players who never were indicted, to proceed. Some thoughts follow. 1) The claim by the three indicted players for a Fourth Amendment malicious prosecution violation failed because the independent decision of the prosecutor to seek and indictment (and the independent decision of the grand jury to indict) broke the causal chain between the officers' conduct and the unconstitutional prosecution. Absent allegations that the officers affirmatively misled or unduly pressured the prosecutor to seek that indictment, his acts insulate the officers from liability. The court further rejected the argument that the police and Nifong conspired to seek an unconstitutional indictment and prosecution, emphasizing the duty of police and prosecutors to work together in seeking to establish probable cause and to seek indictments; a "conspiracy" thus could be alleged in every case. On a related point, the court in a footnote rejected an overlapping Fourteenth Amendment substantive due process claim against the officers for fabricating evidence. Substantive due process is not available when there is an "explicit textual source" for a constitutional claim; because the claim could be brought under the Fourth Amendment, the Fourteenth Amendment could not provide the basis for a claim. This result seems correct, although it illustrates well the difficulty (if not impossibility) of using § 1983 to challenge misconduct in the criminal justice system. A prosecutor enjoys absolute immunity in seeking and obtaining an indictment, while his conduct insulates police officers from liability, at least absent affirmative lies or concealment of evidence. The court was a bit too dismissive of the possibility of a conspiracy to indict, although that may have been because the complaint itself showed Nifong as the bad actor, taking weak evidence, which the officers themselves insisted was weak, and moving forward with an indictment. On the other hand, because police never themselves initiate a prosecution, perhaps the Fourth Amendment is the wrong source; perhaps cases of fabricated evidence should be handled under substantive due process--after all, it is hard to imagine what misconduct could be more "outrageous" than fabricating evidence. 2) The claims against the City of Durham had to be dismissed once the court held that there was no underlying violation. The same for the "stigma-plus" S/D/P claims against police officers who made public statements suggesting the players' guilt. The DA's independent decision to seek the indictment broke any causal connection between the statements and the indictment, eliminating any "plus" necessary to state a claim. The latter was an unfortunate way to resolve it--I would have liked to hear the court take on whether "stigma-plus" was a valid theory of liability. 3) Judge Wilkinson wrote a strongly worded concurrence, criticizing the e plaintiffs' lawyers for overreaching, both in the dramatic numbers of claims asserted (23, 32, and 40, among the three complaints--and the unindicted players, who never got dragged into the system, actually brought more claims than the indicted players), the "sweeping scope" of the litigation, and the "overwrought" nature of the claims and the allegations. Wilkinson had a stronger position against "stigma-plus" claims as inconsistent with SCOTUS precedent; he also read Iqbal to require particular allegations of precisely what each supervisor did to cause the violations alleged; simply naming names, without identifying their conduct, is insufficient. 4) The state-law malicious prosecution claims remain alive against the officers, as do the claims against Duke University (who could not appeal at this non-final stage) and Nifong (who did not appeal the denial of his motion to dismiss. And despite Wilkinson's point that this case continues more than six years after the criminal charges against the three players were dismissed and coming up on seven years since the infamous party, the case goes on. Richard Sherman successfully appeals drug test result: Did NFL avoid StarCaps II? Seattle Seahawks corner back Richard Sherman, who threatened to sue the NFL if they suspended him for a positive drug test result, successfully appealed the result on grounds the test was corrupted. Had Sherman been suspended and sued, he likely would have relied on the StarCaps litigation - where Minnesota state law was viewed as protecting NFL players in spite of conflicting CBA provisions (the players ultimately lost the case but succeeded in showing state law applied). NCAA Investigators: are they like prosecutors or cops? "The NCAA does not operate like a prosecutor's office or a police department where there are clearly understood constitutional limits," said Geoffrey C. Rapp, a University of Toledo law professor and editor of the Sports Law blog. "They don't have a structure in place to ensure consistency." ESPN reports that Britain's Sunday Times has sued Lance Armstrong, seeking to recover more than 1 million pounds (more than $ 1.6 million) that the paper paid to Armstrong to settle a prior defamation action that Armstrong brought against the paper for repeating allegations that Armstrong doped. The theory is that Armstrong initiated "baseless and fraudulent" proceedings by alleging that doping allegations were false and insisting in settlement negotiations that he had never doped. UK law is obviously quite different than US law. Still, I cannot imagine this suit can work. By bringing the suit, Armstrong simply put the paper to its burden of proving its allegations were true (a key difference between UK and US defamation law, where the plaintiff must prove falsehood). He was free to deny the truth of those allegations, both in bringing the suit and engaging in settlement negotiations. Given my First Amendment views, I am no fan of British defamation law or of worthless defamation suits that are designed to intimidate the press. But the notion that such suits, and their settlement, constitute actionable fraud seems equally wrong. Wendy Thurm over at FanGraphs has written an interesting story looking at the use of mutual options in MLB player contracts. As she notes, the mutual option only vests if both the player and the team agree to extend the contract for another season. Not surprisingly, Wendy finds that these clauses have rarely been exercised by both parties, as usually one of the two sides determines it would be more advantageous to walk away from the agreement. Nevertheless, she identifies several reasons why it may make sense for such a provision to be included in a player's contract. First, a new law employment report finds: "Legal jobs in the sports industry are red-hot right now". Any good news on legal employment is good news, but it's particularly encouraging to see it concern our area of law -- especially for those of us who teach students hands-on job skills in preparation for entering this awesome field. 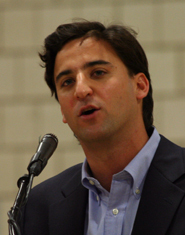 Second, Aaron Zelinsky, author of two excellent sports law-related Yale Law Journal articles -- The Supreme Court (of Baseball) and The Justice as Commissioner: Benching the Judge Umpire Analogy -- has been chosen to become a United States Supreme Court clerk. Aaron is also a contributor to Sports Law Blog, having authored Three Strikes for the National Labor Relations Act, among other contributions. For those of you who don't know, it's almost impossible to become a Supreme Court clerk. I don't know the exact percentage of applicants who get a slot, but it's probably less than 1%. Just as revealing: many of whom that are not picked are themselves outstanding candidates. To have a sports law author in this truly distinguished group is a positive sign for the scholarship we produce. Aaron is possibly/probably the first sports law author to become a U.S. Supreme Court clerk. It was only a matter of time and it's great that Aaron is the one to do it. And of course, this good week of sports law news follows The Summer of Sports Law, as penned by the estimable Warren Zola. And if by chance the Mayans prove right on Friday, at least sports law is going out with a bang! I have returned to writing about the infield fly rule, an expansion of the short defense I wrote in October. Thinking about particular examples of infield fly situations (or non-examples) in the context of the full baseball rulebook brought me back to the judge/umpire/calling balls-and-strikes analogy. In particular, I come back to the argument (which I have made before) that one problem with the analogy is that it understates the complexity of the decisions that umpires have to make. And I keep returning to one historic play that demonstrates this complexity. The Situation: (sorry not to have video to embed--it's really hard to find baseball footage online): Game 4 of the 1978 World Series between the Dodgers and Yankees; Dodgers leading 2 games to 1 and 3-1 with the Yankees batting in the bottom of the sixth. Reggie Jackson on first, Thurman Munson on second, one out; Lou Piniella batting. Piniella hits a low (ankle-high) line drive up the middle, to the left of Dodgers shortstop Bill Russell. Russell moves to his left, catches the ball at his shoe tops, drops it, picks it up as his body is continuing to move left, steps on second for the force out, then throws to first. Jackson had stopped running when he saw Russell initially catch the line drive and he is standing between first and second. As Russell's relay is coming, Jackson (imperceptibly) sticks out his right hip; the ball hits his hip and caroms into right field. Munson scores, Piniella is safe at first. 1) Infield Fly: This is a potential infield fly situation (runners on first and second, less than two out). So the second-base umpire first had to determine that the ball hit was a line drive, to which the IFR does not apply, rather than a fly ball. Easy enough decision to make here--the ball clearly is a line drive and not easily playable--but the umpire at least must consider the rule in passing. 2) Intentionally Dropped Ball: Rule 6.05(l) provides that a batter is out and the ball is dead if an infielder intentionally drops a fair fly ball, including a line drive, where any force out is in effect. So the second base umpire had to determine whether Russell had intentionally dropped the ball to get a double play. He concluded it was not deliberate, presumably by reading where the ball was hit, how quickly and far Russell had to move to his left, and Russell's body language suggesting he was scrambling to pick the ball back up rather than being in control. 3) Interference: This is the one for which this play is remembered. Rule 7.09(f) provides that both the base runner and the batter are out and the ball is dead if a base runner "willfully and deliberately interferes" with a fielder in the act of fielding a batted ball with the "obvious intent to break up a double play." So the question is whether Jackson "willfully and deliberately" interfered with Russell's relay throw. The first base umpire decided he was not, presumably because Jackson was genuinely hung-up on the play. The runner need not move all the way out of the baseline as the throw is coming (they usually do as a matter of self-preservation). It appears on slow-motion that Jackson did stick his right hip out as the ball approached, but the umpires did not have that luxury of breaking the play down that much. Whether you think the call was right or wrong probably depends on your rooting interests--I was 10 years old and living in northern New Jersey at the time. My point is that the umpires actually had a huge amount to watch, process, and interpret. And it is far from a simple or robotic task. No. 2: Why would dissolving the union give the NHLPA any negotiating leverage if it’s widely held that the litigation they’re about to embark down is unlikely to ever reach its conclusion? Isn't this just another stalemate on top of an existing one? Grow: “It's a really interesting question (and merits a longer answer than I originally anticipated). Disclaiming interest almost certainly would have given the players significantly more leverage had it been done back in October. If they had dissolved the union at that time, there would still have been plenty of time for a court to issue a preliminary ruling on the legality of the lockout before the entire season was endangered. And had the court actually gone so far as to enjoin the lockout, it obviously would have been a huge win for the players. “Now, though, there most likely isn't enough time left to get a preliminary ruling before the league cancels the season (although it would be interesting to see what the league would do if a court enjoined the continuation of the lockout in, say, late-February). You can read the entire piece here. Meanwhile, for more regarding the NHL lockout, check out Sports Law Blog's prior commentary on the dispute. One thing that makes baseball unique is that managers and coaches are allowed to come onto the field for some purposes, including arguing with the umpires (I've always believed this is one reason why baseball coaches, alone among all other coaches, where the same clothes as the players). Here is a fun piece from MLB.com (H/T: Deadspin) detailing what managers actually are saying during those seemingly heated nose-to-nose shouting matches. Some of it is pretty funny. Building off Nathaniel Grow's excellent post from yesterday, various sources report that the NHL players have indeed begun voting to allow their union's executive board to file a formal "disclaimer of interest." This disclaimer of interest would end the union's collective bargaining relationship with the NHL -- making it easier for the players to bring an antitrust claim against the league. If the NHL players vote favorably, it would mark the fourth time in sports-labor history that a players union has gone this route. The first was on November 3, 1989, when the NFLPA voted to renounce collective bargaining and then filed a labor organization termination notice with the U.S. Department of Labor -- leading to the Powell III, McNeil and White lawsuits. The second and third involved the NFLPA and NBPA -- both in 2011. For more on past use of this strategy and its outcomes, see my article from this morning on Forbes SportsMoney. Let Congress solve the NHL labor dispute and let the NHLers solve the impasse on the fiscal cliff and gun control, since neither seems capable of solving their own problems. Friday was a busy day in the on-going NHL lockout (for Sports Law Blog's prior coverage of the dispute, click here). 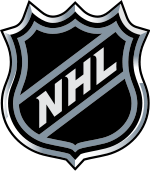 In the early afternoon, news broke that the NHLPA's executive committee voted on Thursday night to seek the full union membership's authorization to file a disclaimer of interest, thereby permitting the committee to dissolve the union in order to file an antitrust lawsuit against the league challenging the legality of the lockout. Then a few hours later, the NHL announced that it had filed a lawsuit against the NHLPA in federal district court in New York, preemptively seeking a declaratory judgment that its lockout does not violate the law, and that any dissolution of the union would be ineffective. The NHL's complaint is available here (courtesy of Canada's Globe and Mail). The case has been assigned to Judge Paul Engelmayer, a 2011 Obama appointee. Due to his short tenure on the bench, Judge Engelmayer doesn't have much of a track record in either labor or antitrust suits, making him a bit of a wild card for this case. The NHL's court complaint is strikingly similar to the one filed in August 2011 by the NBA against the NBPA, and at times copies much of the NBA's earlier language (this fact is not particularly surprising given that both leagues are represented by the Proskauer Rose and Skadden Arps law firms). As with the NBA, the NHL argues that any decertification or disclaimer of interest by the NHLPA would be an impermissible bargaining tactic and little more than a sham. The league also argues that such a maneuver would be ineffective under federal labor law, and therefore would not give players the right to pursue antitrust litigation against ownership under federal law. The NHL's complaint also copies the NBA's most unique claim, asserting that if the union does in fact dissolve then any existing player contracts would become null and void. Basically, the league's argument is that because the CBA specifies most of the provisions in the NHL's standard player contract, any repudiation of the CBA by the players (e.g., by dissolving their union) would terminate all existing contracts governed by the CBA. This is a completely novel legal theory -- no court has ever endorsed the argument -- but one that could nevertheless cause players with long-term contracts some hesitancy before agreeing to dissolve the union. On the other hand, talented young players who are otherwise years away from free agency may not mind having their contracts voided, as it could theoretically give them the ability to sign new agreements on the open market. Despite the many similarities, there are some differences between the two complaints. First, the NHL makes use of an argument that Marc Edelman anticipated a couple weeks ago, asserting that the league operates in a "worldwide relevant geographic market" (see paragraphs 13 and 99-101). In other words, the league is basically arguing that it competes with other foreign leagues for talent and that professional hockey players thus have employment opportunities all across the globe. That is potentially significant because in order for the NHL players to get an injunction blocking the lockout they must be able to show "irreparable harm." The fact that hockey players can potentially go to Europe and play professionally for a significant salary reduces the injury inflicted by the NHL's lockout, perhaps making it less likely that the court would agree to enjoin the lockout. That was true in the case of the NBA to some extent as well, but probably provides the NHL with a stronger argument given the more comparative salary levels abroad in professional hockey. Another difference between the NHL's complaint and the one filed by the NBA in 2011 is the NHL's extensive use of recent quotes from professional hockey players to support the league's argument. Specifically, the NHL cites various news reports in which players admit they are actively considering dissolving the NHLPA (pages 20-21) and which suggest that the maneuver would be part of the union's negotiating strategy (pages 24-26). The complaint also cites recent statements from players expressing strong support for the union's leadership (pages 26-27), lending further credence to the NHL's argument that a disclaimer of interest would not reflect any dissatisfaction with the union, but instead simply be an improper bargaining ploy. Finally, the NHL and NBA complaints differ in one other significant respect. Whereas the NBA was able to point to specific instances in the past in which the NBA players had threatened to dissolve their union during collective bargaining, the NHL was unable to point to any such history by the NHLPA. As a result, the league had to argue that the hockey players were likely to reform a union quickly after reaching a satisfactory agreement based on the prior behavior of NFL and NBA players. Along these lines, the NHL notes that the NHLPA is represented by James Quinn, the same attorney who has represented the NFLPA and NBPA in the past. While the NHL is likely correct that players would opt to reform the NHLPA should they reach a satisfactory settlement with the league, I suspect the court will nevertheless be a little hesitant to hold the recent experiences in the NFL and NBA against the NHLPA since it is a wholly separate union with a different membership and management. Ultimately, the NHL's decision to file suit was not particularly surprising. It appears that the league had had this complaint prepared for some time, and was simply waiting for the NHLPA to take the first formal step towards dissolving the union before filing suit. By striking first, the NHL was able to pick the forum it believed was the most favorable to its case. As Michael McCann has previously noted, precedent in the Second Circuit appears to be favorable to the league on these matters. It will be interesting to see if this move further antagonizes players, or if it just proves to be a minor bump on the road towards a new agreement. 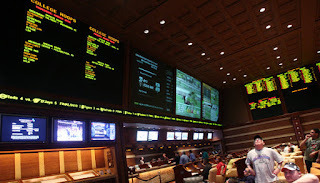 The on-going litigation involving New Jersey's plans to allow licensed sports books recently picked up steam. Multiple pleadings (with dozens of exhibits attached thereto) were filed last week. In the course of finishing up a 30,000+ word law review article that is tangentially related to the lawsuit, I pored through hundreds of pages of documents from the case. My review was revealing (despite the extensive redaction). I shared some of my thoughts a couple of days ago with David Purdum of SportingNews. A portion of our discussion can be found here. Oral arguments on the standing issue take place on December 18. Via Nathaniel Grow (who teaches Legal Studies in the business school at Georgia): The image at left (click to enlarge) is a page from the October issue of Yankees Magazine and features the team's ticket policy. Note the underlined language in the inset at the top--fans acknowledge that team policies banning foul/abusive language and obscene/indecent clothing do not violate their free speech rights and they waive any free-speech objections to those policies or their enforcement. I find it interesting that the team is now framing its attempts to regulate fan expression explicitly in free-speech terms. It suggests their recognition of my core argument--that fan expression, even profane or objectionable fan expression, is subject to First Amendment protection and analysis. This policy is an effort to wiggle away from that legal reality. Of course, the idea of "acknowledg[ing]] and agree[ing]" that something does not violate one's rights when it probably does is pretty Orwellian. It goes well beyond a waiver of a claim into a compelled agreement to an alternate reality. More fundamentally, even as a straight waiver, it cannot possible be enforceable. Assume for the moment the Yankees are a state actor in managing the ballpark--I argued they were with respect to the old Yankee Stadium, which was owned by the City of New York, although the analysis changes for the new ballpark, which is privately owned but (largely) publicly built. The government cannot condition access to a public forum on a person waiving their right to challenge constitutionally suspect limitations on their speech in that forum (imagine a parade permit saying "As a condition of accepting this permit, you agree that police can halt the parade if your speech is objectionable"). Nor is this saved by the fan's compelled acknowledgement that "such time, place and manner of [sic] the restrictions are reasonable." While it is telling that the team is using those precise words, a TPM restriction must be content-neutral; a ban on foul language and indecent clothing is so obviously not content-neutral. Finally, I do note that the waiver only applies to dirty words and dirty clothes and not to other possible free-speech violations, such as compelling fans to remain standing by their seats for "God Bless America" or other forced patriotism. I wonder if that is an oversight or if the team has genuinely given up on those efforts. I have not read this yet, but I wanted to flag a new article in the Utah Law Review by Michael H. LeRoy (Illinois), titled Federal Jurisdiction in Sports Labor Disputes. He argues that federal courts (especially federal district courts) have been improperly hearing (and issuing injunctions in) Sherman Act claims by athletes and sports unions, claims that properly are subject to collective bargaining and thus should be barred by the Norris-LaGuardia Act, which strips federal courts of jurisdiction to enjoin strikes or other labor activity. My database of 83 published court opinions from 1970-2011 shows that pro players used conflicting federal laws to improve their labor market mobility. They formed unions under the National Labor Relations Act (NLRA), and bargained collectively with leagues. But they often failed to negotiate significant changes to league rules that bound them perpetually to a team. Consequently, they challenged these practices as restraints of trade under the Sherman Antitrust Act. Thus, players used a dual engagement strategy of bargaining with leagues under the NLRA and negotiating antitrust settlement agreements under the threat of treble damages. My study exposes a recurring jurisdiction problem that Congress addressed 80 years ago — the inappropriate role of antitrust courts in labor disputes. Ironically, companies used the Sherman Act, a law meant to curb corporate monopolies, against unions. By 1914, Congress enacted a “labor exemption” in the Clayton Act to protect workers from this misuse of antitrust law. But the labor exemption was vaguely phrased. After judges continued to order injunctions against unions, Congress angrily stripped their jurisdiction in the Norris-LaGuardia Act. This history sprang to life in my study. Some courts recognized the conflict between antitrust and labor law — and therefore denied jurisdiction to player complaints, or ruled that labor restraints are immune under the Clayton Act exemption. But these courts were outnumbered by those that intervened under the Sherman Act in these labor disputes. This sets the context for my key findings. In 21.7% of their cases, district courts issued antitrust injunctions, but rarely denied a motion for this order (5.0% of their cases). But appellate courts behaved differently: They stayed or vacated injunctions in 34.8% of their cases, but affirmed only one injunction (4.3%). In a second key finding, district courts rejected the antitrust labor exemption, a league defense, in 15.0% of their cases, and granted it in only 8.3% of their cases. However, appellate courts differed, applying this defense in 26.1% of their cases and rejecting it once (4.3%). Viewed together, the statistics show that district courts treated these disputes as antitrust issues amenable to federal jurisdiction, while appellate courts strongly disagreed by viewing them as labor disputes that were inappropriate for their jurisdiction. My study yields three conclusions. First, Congress did not want the Sherman Act to supply one side in a collective bargaining relationship with more bargaining chips to play against the other side. Unfortunately, district courts ignored congressional intent to stay out of labor disputes which players dressed-up as antitrust problems. Second, federal courts unwittingly contributed to labor disputes by creating uncertainty as to whether bargaining over league-imposed labor market restraints were governed by labor or antitrust law. Courts were therefore partly to blame for the economic interruptions that grew out of sports labor disputes in 2011. Finally, I observed a deep conflict between district and appellate courts. Until district judges restrain their sympathies for players, these judges will be integral actors in professional sports labor disputes. And unless these judges learn from their appellate brethren, they will risk the institutional disrepute that befell the federal judiciary in the early twentieth century. The Rockets, however, have no ability to modify its 82-game regular season schedule. Like every other team’s schedule, the Rockets’ schedule is determined by the league in accordance with league policies and CBA protections for players. The league sets the date, time and location for the 1,230 games played each season by the 30 teams. In setting teams’ schedules, the league tries to treat every team as equally as possible. 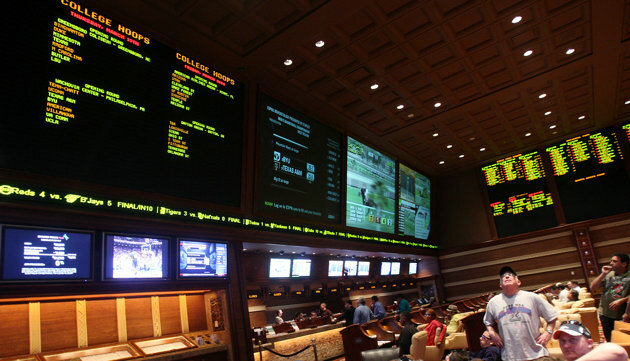 For instance, by rule, each team plays two home games and two away games against each other team in its division; each team plays three or four games against other teams in its conference; and each team plays one home game and one away game against each other team in the opposing conference. There are myriad other policies, including prohibition of games played on three consecutive nights, prohibition of games played on days when players have travelled across two time zones, and restrictions on games played on holidays. Availability of arenas, many of which are shared with NHL teams and host music concerts and other sporting events, is also considered. The Rockets, in other words, cannot unilaterally modify its schedule so that it accommodates White’s anxiety disorder and fear of flying. Expecting the NBA to modify the schedule to accommodate one of the league’s 450 players also seems unreasonable. The complexity of scheduling would make such a request extremely difficult. Even assuming such a request is technically feasible, honoring it might undermine fairness and player protections. For instance, if the Rockets are able to play more home games than other teams, it would give them a significant advantage. 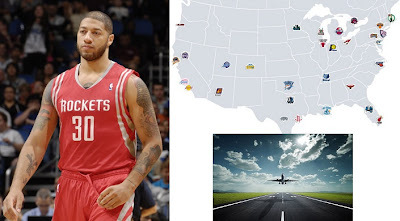 The same would be true if the Rockets received an easier travel schedule. Plus, what would happen if the Rockets traded White to another team? Would the new team’s schedule be changed and the Rockets schedule reverted back to normal? While I generally agree with Rick about the unseemliness of the college football (and basketball) coaching carousel, my school is experiencing the flipside as we speak, illustrating why coaches do what they do and need to get the best deal at the best job they can. A year ago, FIU football coach Mario Cristobal was on a two-year run that included a conference championship, some wins over BCS schools, and consecutive bowl games. Several years ago, just before or just after Cristobal took over the program, it was ranked as the next-to-worst program in Division I-A (and was on probation). Cristobal received strong consideration for the Pittsburgh job and was apparently all set to take the Rutgers job (his attorney was negotiating terms). But he instead decided he wanted to stay in Miami (where he was born and raised) and at FIU. You can call it loyalty, although he was well-compensated for staying. But he did stay to try to continue building his program. Last week, after an unexpectedly poor season that included many injuries (including to the starting quarterback and running back) and four close and/or overtime losses (including one in which a receiver was tackled inches short of the goal line on the last play of the game), Cristobal was fired. FIU has pretty much gotten killed for the decision, which leaves the school with the glaring question of who is going to want the job--both given the limitations of the FIU job, as well as the unceremonious way Cristobal's tenure ended. The point is that while coaches are trying to move around and up, they face the uncertainty of being subject to termination at will (yes, they still get paid, but that is not the same thing as job security). So I am less convinced that there is anything wrong with a coach dumping his current school for something better, because his home school can just as easily dump him at anytime. As the former AD at South Alabama said in The Times article, "If you have an opportunity to move, you move. . . .You have to." 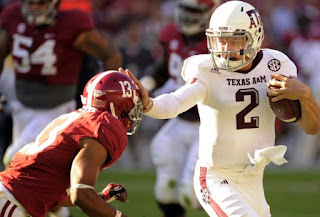 Last night, Texas A&M quarterback Johnny Manziel won the Heisman Trophy, making him the first freshman (albeit a "redshirt" one) to do so in the history of the award. His situation highlights the restrictions placed on college athletes, without a union representing their best interests, by both the NFL and NCAA. 1. Texas A&M plays in the 2013 Cotton Bowl on January 4th v. Oklahoma. a. Payout to University is projected to be $ 7.35M. b. Manziel, and everyone on a team playing in a post-season bowl game, are allowed to receive gifts up to $550 in cash value per NCAA rules. a. Would be eligible for 2014 draft, since he will be three years removed from his high school graduation—2011 (redshirt), 2012 (freshman), 2013 (sophomore year). 3. Texas A&M is able to market and sell any merchandise it wants, using the name and image of Johnny Manziel. 4. Texas A&M, the SEC, and broadcast stations will be able to market his appeal to corporate sponsors, raising rates and generating revenue for their broadcasts. 5. In order to retain his NCAA eligibility, Johnny Manziel is unable to obtain any financial benefit off his success as a clear violation of NCAA amateurism rules. The poaching season is finally here! John Grupp and Scott Brown at the Pittsburgh Tribune-Review discuss whether anything can be done to stop college football coaches from jumping ship. I spoke with Marketplace about Louisiana Tech's curious decision to decline a bowl game. It wasn't over principle, nor was it a commentary about how college athletes should be treated. Instead, it seemed to be about $$$$ -- namely, trying to get the Independence Bowl (which had invited it) to give Louisiana Tech more time to land a more prominent, lucrative bowl bowl. The move backfired. Today is Day 80 of the NHL lockout, and it is beginning to feel as if the entire 2012-13 hockey season could get cancelled, much like it was in 2004-05. Michael McCann recently blogged about all of the NHL game cancellations. But, how did things get this bad? Here are my thoughts on why the NHL and the NHLPA have struggled to come to an agreement. (For more Sports Law Blog commentary on the NHL labor situation, see here, here, here, and here). 1. The NHL is trying to bargain like it's a monopoly, but it isn't. Players can go overseas. The NHL's lawyers seem to be taking the same hard-line bargaining position in their labor negotiations as the NFL did in 2011 -- hoping that the union will eventually break and accept a large salary reduction. However, various aspects of the leagues' bargaining situation are different -- making similar results unrealistic. Most notably, the NFL is a near monopoly, meaning that during a work stoppage NFL players have no other traditional source of employment. By contrast, the NHL players have a bona fide opportunity to find similar work overseas -- especially in Eastern Europe. These international opportunities are not lost on NHL players, with more than 150 players currently competing in leagues across the Atlantic. Many of these players are even competing on teams based in their home countries. As more NHL players recognize the opportunity to command salaries in foreign leagues, the players overall become increasingly suited to withstand a long lockout without needing to dip into personal savings and loans. Thus, as more NHL players accept employment overseas, it becomes less realistic for the NHL owners to refuse to make meaningful bargaining concessions. 2. Hockey players remember taking a huge pay cut in 2004-05. And they are still resentful. In addition to more alternative employment opportunities than in football, many veteran NHL players may also feel as if they've already made a major sacrifice -- having previously accepted a 24% pay cut to settle the 2004-05 lockout. Thus, from an emotional perspective, they are less likely to cave again. One sign that the NHL players were unhappy with the 2004-05 collective bargaining results was the naming of Donald Fehr as their labor leader just a few years back. Before joining the NHLPA, Fehr was the head of the Major League Baseball Players Association. Fehr has a track record for enduring long labor stoppages to get his desired result. Indeed, he was head of baseball's players association during the strike-shortened 1994 season that included the cancelling of that year's World Series. 3. NHL owners may not entirely fear decertification due to potential lack of "market power"
Moreover, unlike the NFL owners, NHL owners may be less fearful of the players pursuing a decertification strategy -- thus almost baiting the players' association to go that route. This is based on questions surrounding the likelihood of a decertified NHLPA ultimately prevailing on an antitrust suit against the league. As antitrust scholars can explain, for professional athletes to win an antitrust challenge against their league, one of the elements they will likely need to show is "market power." This is "the power to control prices or exclude competition" within any relevant market. It is well established that the NFL has market power over its labor force -- making this element easy for a decertified NFLPA to meet. However, there is at least one court decision, Fraser v. Major League Soccer, that leaves open the possibility that if an American sports league competes in a global market for players, it might be found to lack market power. With more than 150 NHL players currently competing overseas, the NHL's lawyers may indeed believe the league lacks adequate market power for players to win an antitrust lawsuit under Section 1 of the Sherman Act. 4. Owners and players don't fear the 'gamer'. The NHL gaming market is substantially smaller than that of other sports leagues. Finally, albeit perhaps least significantly, the NFL likely received strong pressure to settle its labor dispute from their business partners affiliated with the rapidly growing fantasy sports gaming market, such as ESPN and CBS. However, whereas there are currently more than 20 million Americans playing fantasy football, there are less than 2 million that play fantasy hockey. Thus, the fantasy sports lobby is likely placing little, if any, pressure on the NHL to reach a settlement.